Everyone is talking about e-mobility. So are we. Because we know that the days of the combustion engine are numbered. But what will the electrically powered cars of the future look like? What range will they have? And above all: will they be affordable? Many questions still have no clear answers. A great deal is possible. But one answer is certainly steel. It will still be many years before the majority of our cars are electric. 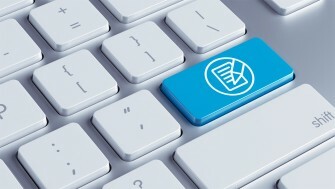 But the fact is that the auto industry is set to undergo a dramatic transformation. As one of Europe’s leading steel producers we will supply suitable materials to support this transformation. Over more than three decades and through a raft of technology projects we have acquired extensive automotive expertise and systematically evolved from a material supplier to a partner to the auto industry. Electrical steel is the core material for every electric car. The special steels that control the flow of electricity form the basis for every electric motor. Without them, nothing works. In the stators and rotors, electrical steel has a decisive impact on the efficiency of the motor: the more it minimizes the so-called core losses, the greater the efficiency of the motor – and thus the range of the vehicle. thyssenkrupp is Europe’s leading electrical steel producer and manufactures grades that meet the exacting requirements of e-mobility: Core losses are already almost 30% lower than those of conventional grades, while the outstanding strength of the high-tech material permits maximum speeds in the smallest possible space: Steel ensures progress along the road to the e-mobility of the future. The battery is the heart of an electric vehicle. It is the most sensitive and most expensive component in an e-car and accounts for 30 – 50% of the overall vehicle costs. 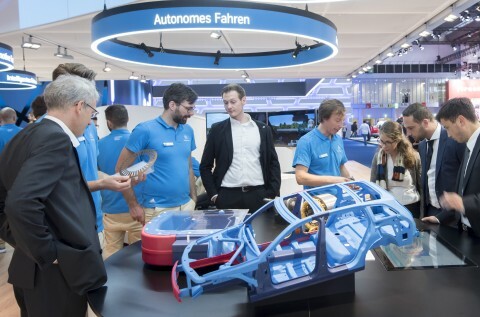 Vehicle manufacturers worldwide are working on strategies to build production capacities and supply infrastructures along the entire value chain. So it is all the more important to develop solutions to protect the battery that do not drive the costs for e-vehicles even higher. The engineers from our steel division have been working hard on ways to protect the central component of electric vehicles. The requirements profile is complex. 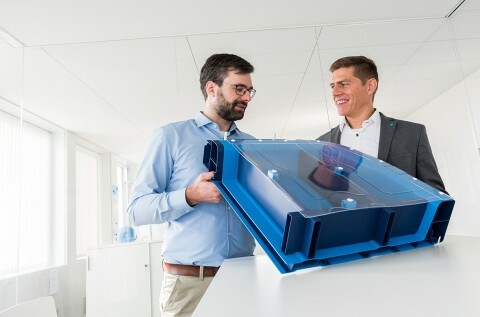 From crash protection and corrosion resistance to battery cooling, the thyssenkrupp team had various tasks to address. In just six months the experts have developed a virtual prototype that meets all the requirements for optimum battery protection. Our solution weighs no more than a comparable aluminum variant and costs just half as much. 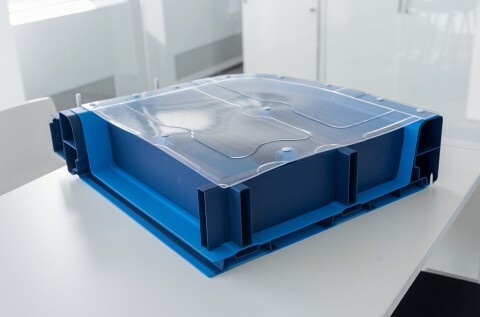 Our battery housing is an ideal application for our new ultrahigh-strength steels. 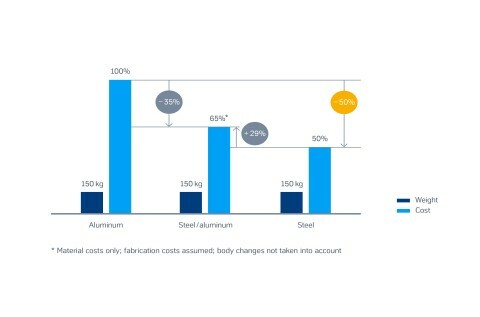 At the same weight, the steel solution offers significant cost advantages over the aluminum version. 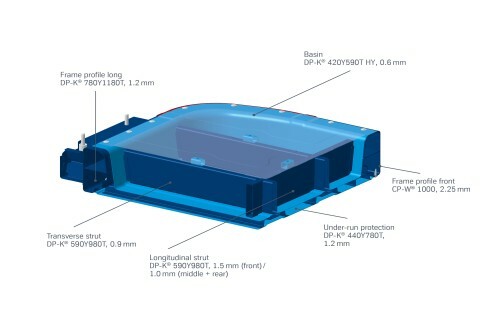 Please contact us for further information and inquiries about our steel battery housing. Reducing weight will be important for e-mobility but it will not play the central role it does in conventionally powered cars – after all, electric vehicles do not emit any CO2. And a 100 kg weight saving in an electric car equates to just 8 kilometers in range. But until we are all driving electric vehicles, lightweight steels will remain a key aspect for cars with internal combustion engines. And developments over the last 15 years have shown that the use of steel for cost-efficient weight reduction has been incredibly successful. Steel delivers the optimum balance between the conflicting objectives of CO2 reduction, costs and safety. One statistic proves this: Steel is the material of choice for around 88% of the European vehicle market – that equates to roughly 19 million vehicles. Electrical steel plays a key role in every generator, transformer and electric motor. It’s not just in the body of electric cars that steel plays a key role. Every generator, transformer and electric motor – the heart of every electric vehicle – requires electrical steel: This material is needed to concentrate the magnetic flux in electric machines and thus also to power electric vehicles. The entire chain depends on steel. Without steel there is no e-mobility. So it looks like the most important automotive material of the past and present will remain the most important material in the future. High-tech electrical steel from thyssenkrupp was shown at Coilwinding in Berlin. Our powercore® contributes to the successful energy transition in charging stations for electric cars. It also ensures the necessary energy efficiency in the stators. New and very interesting was a virtual reality application that digitally illustrates the features and benefits of the steelmaker's products in a virtual world. The interactive app with lots of information about the energy turnaround has proven itself in the last year and was therefore back in 2018 again.